New research suggests that there could be health hazards associated with consuming excessive amounts of beta-carotene. This antioxidant is a naturally occurring pigment that gives color to foods such as carrots, sweet potatoes and certain greens. It also converts to vitamin A, and foods and supplements are the only sources for this essential nutrient. But scientists at Ohio State University have found that certain molecules that derive from beta-carotene have an opposite effect in the body: They actually block some actions of vitamin A, which is critical to human vision, bone and skin health, metabolism and immune function. Because these molecules derive from beta-carotene, researchers predict that a large amount of this antioxidant is accompanied by a larger amount of these anti-vitamin-A molecules, as well. Vitamin A provides its health benefits by activating hundreds of genes. This means that if compounds contained in a typical source of the vitamin are actually lowering its activity instead of promoting its benefits, too much beta-carotene could paradoxically result in too little vitamin A. The findings also might explain why, in a decades-old clinical trial, more people who were heavily supplemented with beta-carotene ended up with lung cancer than did research participants who took no beta-carotene at all. The trial was ended early because of that unexpected outcome. The scientists aren’t recommending against eating foods high in beta-carotene, and they are continuing their studies to determine what environmental and biological conditions are most likely to lead to these molecules’ production. 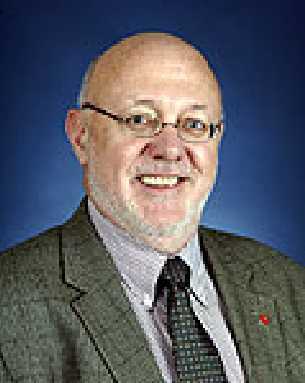 The study is scheduled for publication in the May 4, 2012, issue of theJournal of Biological Chemistry. Previous research has already established that when beta-carotene is metabolized, it is broken in half by an enzyme, which produces two vitamin A molecules. In this new study, the Ohio State researchers showed that some of these molecules are produced when beta-carotene is broken in a different place by processes that are not yet fully understood and act to antagonize vitamin A.
Harrison is an expert in the study of antioxidants called carotenoids, which give certain fruits and vegetables their distinctive colors. Carotenoids’ antioxidant properties are associated with protecting cells and regulating cell growth and death, all of which play a role in multiple disease processes. For this work, he joined forces with co-authors Robert Curley, professor of medicinal chemistry and pharmacognosy, and Steven Schwartz, professor of food science and technology, both at Ohio State. Curley specializes in producing synthetic molecules in the pursuit of drug development, and Schwartz is an expert at carotenoid analysis. Curley manufactured a series of beta-carotene-derived molecules in the lab that match those that exist in nature. The researchers then exposed these molecules to conditions mimicking their metabolism and action in the body. Of the 11 synthetic molecules produced, five appeared to function as inhibitors of vitamin A action based on how they interacted with receptors that would normally launch the function of vitamin A molecules. Once that role was defined, the researchers sought to determine how prevalent these molecular components might be in the human body. 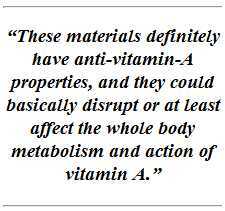 Analyzing blood samples obtained from six healthy human volunteers, the scientists in the Schwartz lab found that some of these anti-vitamin-A molecules were present in every sample studied, suggesting that they are a common product of beta-carotene metabolism. The compounds also have been found previously in cantaloupe and other orange-fleshed melons, suggesting humans might even absorb these molecules directly from their diet. Harrison noted that the findings might explain the outcome of a well-known clinical trial that has left scientists puzzled for years. In that trial, people at high risk for lung cancer – smokers and asbestos workers – were given massive doses of beta-carotene over a long period of time in an attempt to lower that risk. The trial ended early because more supplemented participants developed cancer than did those who received no beta-carotene. This outcome was reinforced by results of a follow-up animal study. The research also has implications for efforts to bio-engineer staple crops in developing countries so they contain excess beta-carotene, which is considered a sustainable way to provide these populations with pro-vitamin A. Existing projects include production of golden rice in Asia, golden maize in South America and cassava in Africa. “A concern is that if you engineer these crops to have unusually high levels of beta-carotene, they might also have high levels of these compounds,” Harrison said. The researchers are continuing to study these compounds, including whether food processing or specific biological processes affect their prevalence. Previous studies have suggested that oxidative stress, which can result from smoking and air pollution exposure, can lead to higher production of these anti-vitamin-A molecules, Harrison noted. This research was supported by the National Institutes of Health and the Ohio Agricultural Research and Development Center. Additional co-authors include Abdulkerim Eroglu, Carlo dela Sena and Sureshbabu Narayanasamy of the Department of Human Nutrition; Damian Hruszkewycz of the College of Pharmacy; and Ken Riedl and Rachel Kopec of the Department of Food Science and Technology, all at Ohio State. Harrison, Curley, Eroglu and dela Sena also are affiliated with Ohio State’s Biochemistry Program. When it comes to improving bone health in postmenopausal women — and people of all ages, actually — a Florida State University researcher has found a simple, proactive solution to help prevent fractures and osteoporosis: eating dried plums. Arjmandi and a group of researchers from Florida State and Oklahoma State University tested two groups of postmenopausal women. 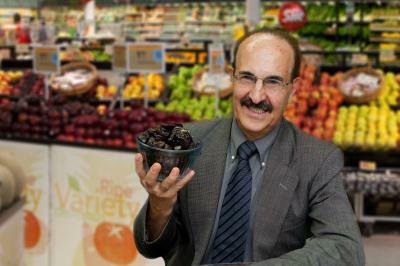 Over a 12-month period, the first group, consisting of 55 women, was instructed to consume 100 grams of dried plums (about 10 prunes) each day, while the second — a comparative control group of 45 women — was told to consume 100 grams of dried apples. All of the study’s participants also received daily doses of calcium (500 milligrams) and vitamin D (400 international units). The group’s research, “Comparative Effects of Dried Plum and Dried Apple on Bone in Post Menopausal Women,” was published in the British Journal of Nutrition. Arjmandi conducted the research with his graduate students Shirin Hooshmand, Sheau C. Chai and Raz L. Saadat of the College of Human Sciences; Dr. Kenneth Brummel-Smith, Florida State’s Charlotte Edwards Maguire Professor and chairman of the Department of Geriatrics in the College of Medicine; and Oklahoma State University statistics Professor Mark E. Payton. In the United States, about 8 million women have osteoporosis because of the sudden cessation of ovarian hormone production at the onset of menopause. What’s more, about 2 million men also have osteoporosis. Women who get most of their daily calcium from food have healthier bones than women whose calcium comes mainly from supplemental tablets. Surprisingly, this is true even though the supplement takers have higher average calcium intake. Adequate calcium is important to prevent osteoporosis, which affects an estimated 8 million American women and 2 million American men. Another 34 million Americans have low bone mass, placing them at increased risk for osteoporosis. Calcium consumption can help maintain bone density by preventing the body from stealing the calcium it needs from the bones, say researchers at Washington University School of Medicine in St. Louis. The researchers’ conclusions about calcium intake, published in the American Journal of Clinical Nutrition, came from a study of 183 postmenopausal women. The researchers asked the women to meticulously detail their diet and their calcium supplement intake for a week. “We assumed that this sample represented each woman’s typical diet,” says senior author Reina Armamento-Villareal, M.D., assistant professor of medicine in the Division of Bone and Mineral Diseases and a bone specialist at Barnes-Jewish Hospital. “In addition to analyzing the volunteers’ daily calcium intake, we tested bone mineral density and urinary concentrations of estrogen metabolites.” The researchers found that the women could be divided into three groups: one group, called the “supplement group,” got at least 70 percent of their daily calcium from tablets or pills; another, the “diet group,” got at least 70 percent of their calcium from dairy products and other foods; and a third, the “diet plus supplement group,” consisted of those whose calcium-source percentages fell somewhere in between these ranges. 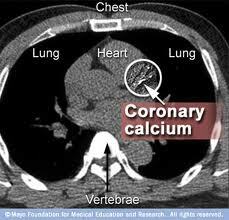 The “diet group” took in the least calcium, an average of 830 milligrams per day. Yet this group had higher bone density in their spines and hipbones than women in the “supplement group,” who consumed about 1,030 milligrams per day. Women in the “diet plus supplement group” tended to have the highest bone mineral density as well as the highest calcium intake at 1,620 milligrams per day. The hormone estrogen is known to maintain bone mineral density. But the standard form of estrogen is broken down or metabolized in the liver to other forms – some active and some inactive. Urinalysis showed that women in the “diet group” and the “diet plus supplement group” had a higher ratio of active to inactive estrogen metabolites than women in the “supplement group.” “This suggests that dietary calcium is associated with a shift in estrogen metabolism that favors production of active forms of estrogen,” says Armamento-Villareal. “Although we’re not yet certain what underlies this effect, it could be that nutrients other than calcium cause this shift. 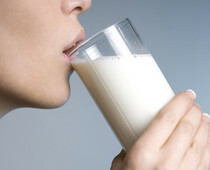 It’s also known that dairy products, which are a major source of calcium, can contain active estrogenic compounds, and these can influence bone density and the amount of estrogenic metabolites in the urine.” Calcium supplements differ in how well their calcium can be absorbed, and this also could play a role in the study’s findings, according to its authors. For example, calcium carbonate tablets need to be taken with a meal so that stomach acid can facilitate absorption, but calcium citrate tablets don’t have this limitation. If the study participants taking calcium carbonate weren’t conscientious about the timing of their supplements, they might not have received the highest benefit from them. “Only about 35 percent of the calcium in most supplements ends up being absorbed by the body,” Armamento-Villareal says. “Calcium from the diet is generally better absorbed, and this could be another reason that women who got a high percentage of calcium in their food had higher bone densities.” Although dairy foods are excellent sources of calcium, Armamento-Villareal suggests that individuals with dairy sensitivities could consume other calcium-rich food sources such as calcium-fortified orange juice. Dark green leafy vegetables also contain calcium, but it is not as readily absorbed as calcium from dairy sources. 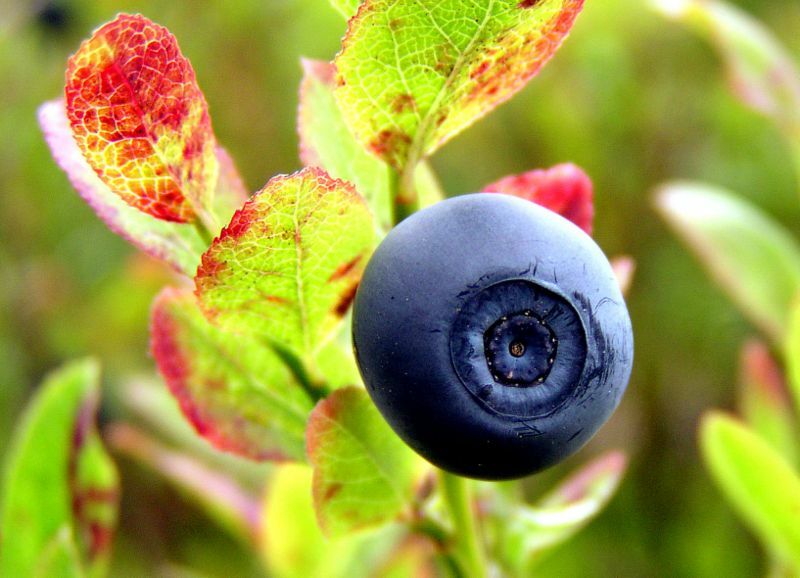 Compounds in blueberries might turn out to have a powerful effect on formation of strong, healthy bones, if results from studies with laboratory rats turn out to hold true for humans. Jin-Ran Chen and his colleagues are exploring this idea in research funded by the US Department of Agriculture at the Arkansas Children’s Nutrition Center in Little Rock.